Value plus incredible performance is what these jacks are all about. 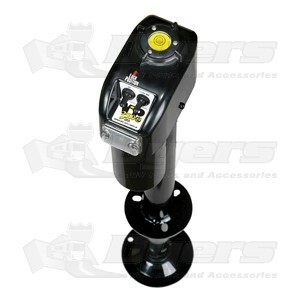 Features easy to operate switches for lifting up to 24" and night light. The length makes all the difference. The extra 6 inches removes having to adjust the length of footpads on other shorter stroke jacks. Also, if you have ever had the fun of needing to use an auxiliary jack because the short stroke out the trailer in an awkward position, this jack eliminates that. This lives up to its billing. So much better than hand cranking my camper to get the equalizer bars on.